Eight months after being ousted from power in Baghdad, the Iraqi tyrant was found in December 2003 hiding out in Ad-Dawr, a town 10 miles (16 km) south of his hometown of Tikrit. 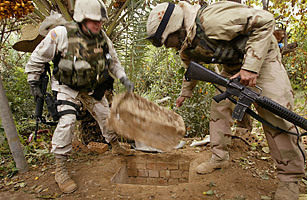 Saddam Hussein was pulled from a hole with a depth of 6 to 8 ft. (2 to 2.5 m) that was wide enough for him to lie down in. Also found in the so-called spider hole? Two AK-47s, a pistol and $750,000 worth in $100 bills. Saddam's capture came after a lengthy investigation in which intelligence officers questioned bodyguards and family members close to the deposed leader. When pulled from the subterranean hideout, Saddam seemed confused and disoriented. After the successful capture, President George W. Bush announced to Iraqis, "You do not have to fear the rule of Saddam Hussein ever again." Saddam was tried in Baghdad for crimes against humanity during his 23-year rule and was found guilty in November 2006. He was hanged the following month. See TIME's story on Saddam's capture.